It's official - Bury Market is the nation's favourite! The famous Bury Market has won top honours after being voted Britain's Favourite Market by visitors in an online poll. It's the latest accolade for the market which has been nationally acclaimed on numerous occasions for its innovation, quality and large number of coach visitors. The trophy was presented by judges at the NABMA Great British Market Awards 2019 (National Association of British Market Authorities) held yesterday in Birmingham. Markets manager Andrew Heyes said: "We're thrilled that Bury Market has once more won a national award, and this one is even more special as it was decided by the people. It's a fitting reward for our traders, who make the market the wonderful place it is and ensure that our many thousands of visitors have a great day out and pick up bargains galore." 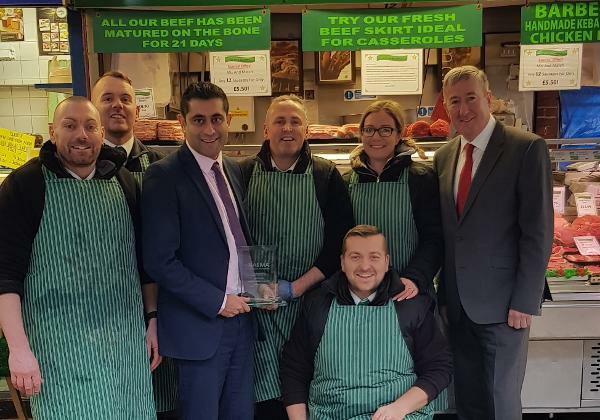 Councillor Rishi Shori, leader of Bury Council, said: "It's long been said that Bury Market is the town's 'jewel in the crown', and this latest award shows just how popular the market is with people across the length and breadth of the country." Enter our competition to win a hamper worth £50 from the World Famous Bury Market.